Red Wine, Green Tea and Dark Chocolate: Walnuts are best for a healthy heart! A new study has suggested that walnuts have a combination of more healthful antioxidants and higher quality antioxidants than any other nut. It positioned walnuts in the No. 1 slot among a family of foods that lay claim to being among Mother Nature's most nearly perfect packaged foods: Tree and ground nuts. "Walnuts rank above peanuts, almonds, pecans, pistachios and other nuts," said researcher Joe Vinson. A handful of walnuts contains almost twice as much antioxidants as an equivalent amount of any other commonly consumed nut. But unfortunately, people don't eat a lot of them. 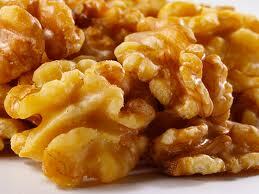 This study suggests that consumers should eat more walnuts as part of a healthy diet. The report was presented at the 241st National Meeting and Exposition of the American Chemical Society.